You are given 4 points on the 2D plane. You should tell whether there is a triangle whose sides pass through all the 4 points, and if there is, then find one such triangle. The outputted triangle can be degenerate as well (that is, all three of its vertices can be collinear). Each test-case is described by a single line containing 8 space-separated integers, x1, y1, x2, y2, x3, y3, x4 and y4. These describe the coordinates of the 4 given points, which are (x1, y1), (x2, y2), (x3, y3) and (x4, y4). For each test-case output its answer in a new line. If there is no triangle which perfectly pass through the 4 given points then output "NO". Otherwise output "YES", followed by 6 real numbers p1, q1, p2, q2, p3 and q3 in the same line. These should describe the vertices of the triangle: (p1, q1), (p2, q2) and (p3, q3). These points can be in any order, but they should satisfy (-106 ≤ p1, q1, p2, q2, p3, q3 ≤ 106) . It is guaranteed that if the answer is "YES", there will be at least one triangle satisfying these constraints. 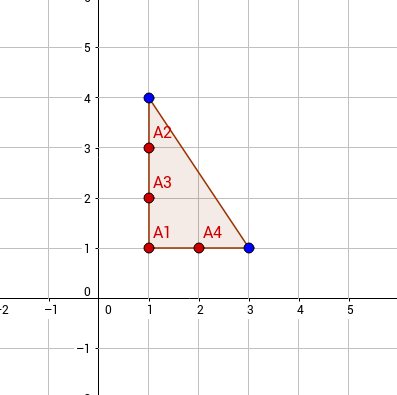 The triangle will be accepted if, for every input point A = (xi, yi), there exists an edge (say its endpoints are B = (pi, qi) and C = (pj, qj)) of the triangle such that the absolute difference between dist(B, C) and dist(B, A) + dist(A, C) is less than 10-9. 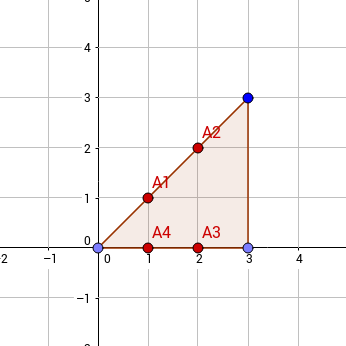 The Ai's (marked in red) correspond to the input points, and the triangle is the outputted triangle.